With some cookbooks, you just open them, find something that looks good and go straight into your kitchen and start cooking. 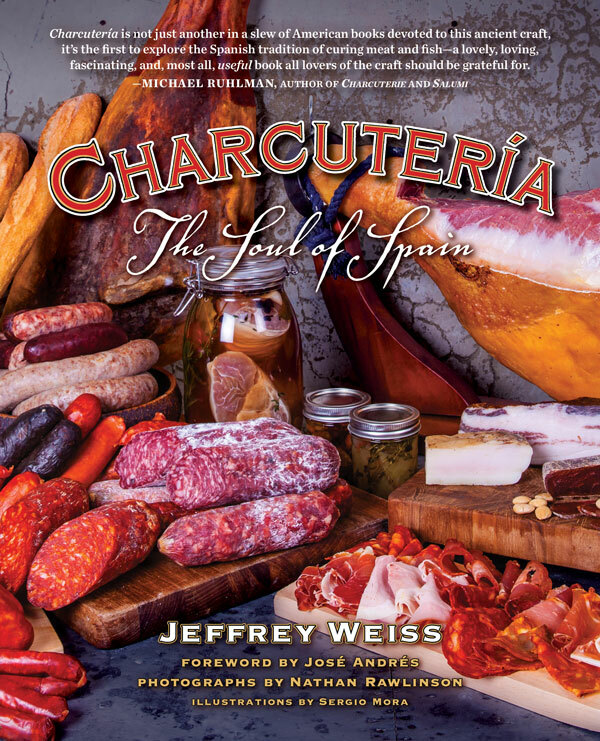 Charcutería – The Soul of Spain, the new book from Jeffrey Weiss, is not that kind of book. This is partly intentional in that the book is structured in such a way as to first provide the history and context around Spanish meat curing and pork butchery techniques, and partly because few among us have all the requisite curing salts, natural sausage casing and pounds of pork fat on hand. Reviewers of Weiss’ book have described it as a book that needed to be written, one that the English-speaking world needed. Depending on your point of view, this may sound hyperbolic. And, in all honesty, I have never once, after reading the book or even after the transcendental experience of jamon íberico, considered trying to cure a leg of ham at home, but behind the hyperbole lies a reasonable point, one that Weiss himself makes early in the book that explains its raison d’etre: namely, that Spanish cured pork products are frustratingly difficult to find in this country due primarily to our friends at the USDA and their absurd food safety restrictions. Regulations, which permit vegetables sprayed with all manner of pesticides, factory-farmed and antibiotic-treated meat, and chemical-laden processed foods of all kinds, but that forbid the majority of what Spaniards have been eating for millennia. As such, those of us who want to enjoy Spanish-style charcuterie may have little choice, but to fashion it ourselves. Weiss notes that in some respects, we should be grateful for this embargo, since on the other side, the Spanish purveyors have steadfastly refused to change their ways and bend to USDA’s will, preferring to honor and retain their age-old practices than profit from the opportunity of jamon-hungry Americans. And, although there has been some relaxation in these restrictions over the past few years to the extent that some Spanish cured products are now available here, the simple fact that the Spanish themselves consume almost all their countrymen can produce means there is always going to be a premium on these foodstuffs. From embutidos (sausages) to jamones (hams) and terrinas (patés) and from Extremadura to Galicia to Castilla Vieja and Catalunya, Weiss guides the reader on a fascinating tour of Spain’s finest cured pork products, paying close attention to regional variations, noting the influences of Spain’s conquest of the New World on chorizo recipes that are not present in the older Medici-influenced flavors of some salamis (salchichones). The hardest to read, but perhaps the most significant chapter of the tour takes us via a matanza (pig slaughter). Weiss’ jocular description of the characters involved, the boozing, and the joys and fatigues of breaking down an entire animal and the fabrication of multiple sausages, hams and terrines makes it feel like a fun romp through what is surely a quite harrowing, but engrossing, process. Even for those of us who are unlikely to ever homemake their own cured meats, this gory context provides an important background for not just understanding the practice and evolution of meat curing, and the differences between the cuts of meat from traditional butchery as practiced in much of continental Europe and the industrial techniques practiced here, but also of the basic history of Spain. 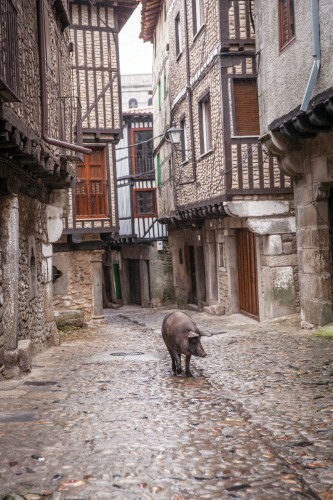 And, if there is any country in the world whose history must be understood through its relationship with its food source, then Spain and the pig are two halves of an ancient tale. Those of you who have read and made recipes in Mark Ruhlman and Brian Polcyn’s Charcuterie and Salami will find much to enjoy in this book, not just in terms of there being even more ways of coaxing seasoned meat into tight skins, but because Weiss does a great job of clarifying what the curing process is and why it’s important to be precise. Those of you who haven’t ready Ruhlman’s book and aren’t likely to attempting home-curing and sausage-making may find that Weiss’ other recipes to your taste providing you can get your hands on sufficient amounts of comparable products. Indeed, therein may lie one of my two slight criticisms of this otherwise excellent, beautifully-illustrated and encyclopedic book. 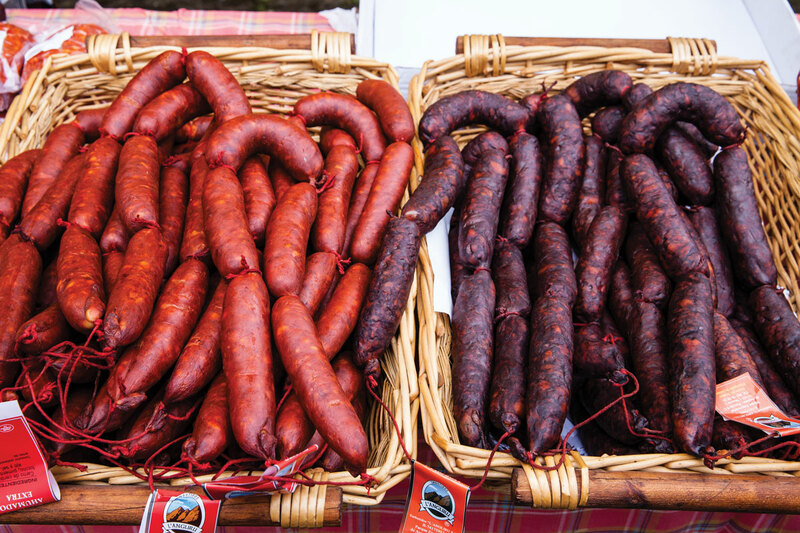 Depending on where you live, access to a quality charcuterie like Spanish-style morcilla blood sausage may be problematic. The internet can still be a great source for mail-ordering, but in some cases you’ll still be out of luck. Also, the inclusion of dessert recipes feels gratuitous. Sure, one of them contains pork lard from Iberico pigs (but where the hell are you going to get that? And if you did, would you honestly make cookies out of it?) and another is for crepes colored with blood, but it feels a little like the author is shoving them in there like too much forcemeat into an intestine rather than, as with the rest of the book, and indeed, Spanish charcutería, it having a more natural and organic feel.